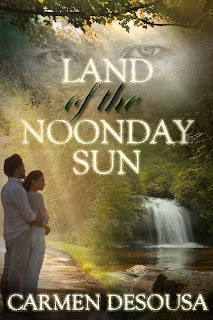 Land of the Noonday Sun. Last week, Cassandra had been left standing on the sidewalk, wondering what she should do about the predicament she was in with this handsome stranger. Well, maybe they might get along…maybe. The evening was beautiful she had to admit. The sun, having just set behind the trees, cast streaks of orange and red across the nighttime sky. The surrounding wood, previously quiet only moments earlier, suddenly filled with chirping. Millions of insects of some sort belted out an unfamiliar melody. She was familiar with crickets and frogs after sunset in Florida, but this was neither. She must have looked confused, because he smiled and motioned his hand to the surrounding trees. “Cicadas, the chirping you’re hearing. They emerge between May and September. Interesting fact, the insects lay dormant for seventeen years before surfacing to mate, only to die afterward—tragic.” He grinned seductively. “There are many things I can teach you, Cassandra,” he drawled, serious again. Ah, romance ala cicada! That's different, and I like it. Interesting six. Love the sexual undertone in his last comment. Nice six. Thanks, Christine. Subtle innuendos, I love them! Intriguing sentences. Love the last line! And I'm sure all the lessons won't be about cicadas LOL! I like how you work in the surroundings to enhance the scene, terrific snippet as always! Ummm no, they won't... I can't wait until the first-kiss scene. Of course, I can't shorten that to a SSS snippet, the reason it gets its own post. LOL! I'm planning 1st week of May, by the way. ooh, can't wait to see what lessons he has in mind ;) And I love you adding in cicadas! I do write romantic-suspense, so it is never that easy. LOL! Thanks, Melynda. Hope your new release has been fun. I bet he could teach her things! LOL. I love how you've incorporated the setting into their dialogue, it really grounds me in the scene. Thank you, Lorraine! I love the scene...and it was just the beginning of the night. LOL! I thought "belted out" was a pretty strong term until I read that they're talking about cicadas... and suddenly, it's totally appropriate. I also love the thought of a drawl. Mmmm. Thank you! I do love them southern men. And you are correct; crickets and frogs are so much softer in their serenading, cicadas demand an audience. LOL! Nice! I can totally relate to this setting, makes me want to lie down in a hammock and read the rest of the story! Awww...thank you, Ann. And I hope you will soon. Did you get a copy of "She Belongs to Me" the other day? If so, you'll want to read first. And all my male protags are southern gentleman and hotties. Also, I love the beauty and laidback setting of North Carolina, such a lovely backdrop for my stories. Great writing, you put me there. Love it! Thank you for sharing with me via Twitter! "I could sense a sudden release in pressure as my voice shattered whatever was separating me from the rest of the forest. I was joined by a thousand cicadas, casting their deafening mating call in the trees as they, too, screamed for someone they loved. A flurry of birds broke out of the trees, creating a dark cloud in the sky. With each gust of wind, the cloud of birds above the forest rippled and shifted in shape, soaring and dipping through the sky in an ebony wave. I watched as the mass swirled above me. It was like a ghostly presence, the haunting movements of the birds growing and shrinking, becoming small before expanding to a large fog. The cloud above the forest grew darker and darker, pulsing in a hypnotic beat as if part of a dance. The hum of the cicadas around me mirrored the movements, keeping time with an urgency that ebbed and flowed."